BUFFALO, N.Y. -- The Bisons were locked into an offensive battle against the Knights on the road in Charlotte Monday night. The Knights threatened with a late comeback, however, Buffalo held on for a hard-earned 8-7 win. Billy McKinney was instrumental in the victory as the outfielder completed the back end of the cycle--he stroked an RBI-triple off the wall in the first and slashed a solo shot in the seventh. The longball turned into the game-deciding run as the Knights erased the Bisons' original seven-run lead. 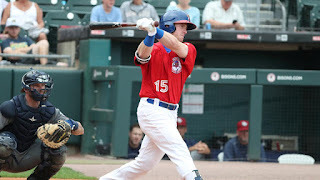 The Bisons went 5-11 with runners in scoring position and drew five walks in the game. The Herd collected ten total hits and all but one batter in the lineup reached base twice. The Herd entrusted closer Justin Shafer to record the two-inning save and he delivered. The reliever pitched a clean eighth inning, but the Knights put the tying run on third base with two outs. Shafer responded by getting Ryan Cordell to pop out to end the game and secure the win. Starter Jacob Waguespack notched his first victory as a Bison in his most recent outing against the Stripers last week and he produced a similar result Monday night as picked up the victory on the mound facing the Knights. Waguespack had a great start to his outing but ran into trouble in the fifth during a five-run frame. In the previous four innings, he had allowed just two hits and no runs while retiring ten straight spanning from the last out of the first inning to the end of the fourth. He also set down the side in order three times in that stretch.